A team of experts from the World Bank and the National Universities Commission (NUC), Abuja, have commended the activities of the University’s World Bank Africa Centre of Excellence in Agriculture (CEADESE), a project sponsored by the World Bank. According to the Director of the Centre, Professor Okanlanwon Onagbesan, the supervisory team always visits the University, every six months, to ensure that CEADESE was doing everything rightly, as expected. The 6-man team was made up of four World Bank representatives alongside two NUC representatives. According to Professor Onagbesan, the visiting team is “Very happy with our (CEADESE) performance. They said we are on course; that we are doing everything well. I think we would achieve our goals as an Africa Centre of Excellence (ACE)”. He said there were 10 universities in Nigeria and 23 in West Africa, designated as Africa Centres of Excellence and presently termed as ACE 1. He disclosed that the Centre was mandated to run postgraduate programmes; which were not only limited to Nigerian students alone, but open to others around the West African region, who they got across to, through different means of advertisement. “CEADESE postgraduate programmes are like normal establishments, modeled on how normal postgraduate programmes should be run. The students do have internship in related industries, where they are specialised and for which they have rated us high by using us (FUNAAB), as a model for others”, he added. According to the Director, the Centre was making progress within the available resources, as he further revealed that at inception, it had 64 students with 50 per cent for Master’s Degrees while the remaining 50 per cent were for Ph.D programmes. The first set of Master’s students would be graduating this year, while the Ph.D students would follow suit, next year. He described the learning process of the students as demand-driven, which makes them to stand out and be more professional above the regular Master’s or Ph.D students. 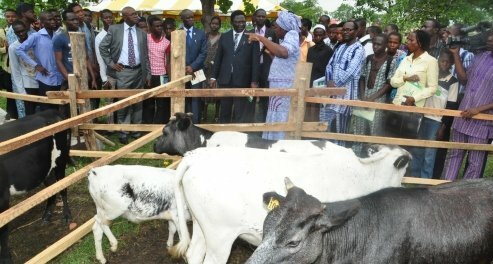 As a means of facilitating easy and faster academic exercise, he said that the Centre supports it students with cash in their research work such that, each Ph.D students is supported with the sum of N1 million while each Master’s student gets a token of N300,000, plus an additional allowance of N25,000 Naira, when on internship. The Don also revealed that the NUC team would be coming back soon; to carry out accreditation of their programmes; which would be the first-ever postgraduate studies’ accreditation in Nigeria, especially in the sciences. This, before the end of the year, would dovetail into international accreditation, under the supervision of the World Bank. The team members also visited the Vice-Chancellor, Professor Olusola Oyewole, where they expressed their satisfaction on what they saw on ground at CEADESE and the ability of the Centre to attract high number of students. Ms. Aisha Garba, who spoke on behalf of the team, disclosed that delay in approval and disbursement of funds was a major challenge being faced by most African Centres of Excellence (ACE), as she solicited the University’s support towards the smooth running of the programmes by giving timely approval to the Centre’s requests. Other members of the team are: Professor Jonathan Mbah, from the Association of African Universities (AAU); Dr. Carl Larsen, representing the World Bank; Professor Raphael Wahonu, also of the AAU; Mr. Obi Ukwuagu and Mr. Michael Ejegwa; both representing the National Universities Commission (NUC), Abuja.